Dog Lap Quilt – Just for Fun! Sometimes you just need to snuggle up in a warm, soft dog quilt. I made this quilt using the dog fabrics from my stash – I’ve got a bunch! Then I decided to add a few black and white dog bones on top of it using just a simple raw edge applique technique. 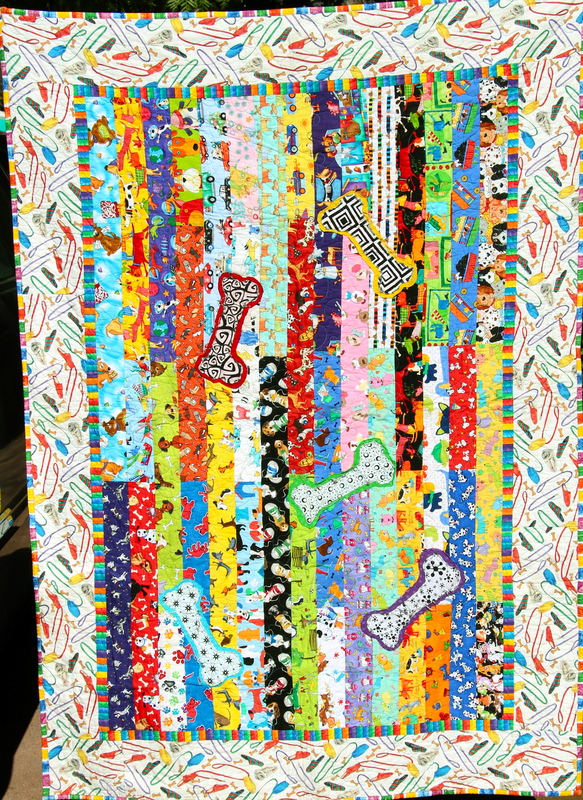 I really love all the dog fabrics because they are so cute and colorful! Plus the back is a dog fabric flannel. Love the fabric in this one. It is full of fun. As a fellow dog lover – you can imagine how fun it is to use only your dog fabrics in one quilt! I wish it photographed better though – it is actually much, much brighter in person! Hi Jo! Thank you 🙂 I am going to pop over to your site now for a peak at what you like to create!